Meller Optics carries a line of stock and custom multiple order waveplates in single crystal quartz and sapphire. 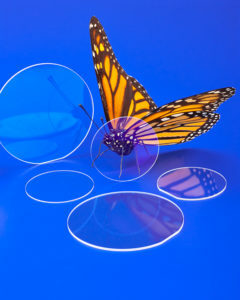 With these two materials, Meller Optics offers polarization solutions from the visible to 4.7 µm. These multiple order quarter wave and half wave retardation plates consist of a single disc of single crystal quartz or sapphire, depending on the application, which is polished to very precise finish, flatness, and thickness tolerances. They can be anti-reflective coated with a “V” coat or broadband AR coating. All the waveplates listed below are single crystal quartz. If you need sapphire, have a special design other than the usual quarter or half wave retardation, need a dual band component, or want a special shape, please Contact Us Delivery on waveplates averages between stock – 2 weeks.